What Kind of Perverted Monster is Matt Lauer and Why did NBC Let him Be It? I’m grateful every day my daughter hasn’t been subjected to this kind of sick depravity. Because I would be in prison. I was afraid the 1% and Congress would be hurt by the bill you’re putting together. It’s such a relief to know that only the middle and lower classes will be. Thanks so much Senator Lamar Alexander and Senator Bob Corker. You guys are real heroes to the super rich. I just hope you don’t have to stay in office to see the death and destruction you’ll cause. The Babylon Bee has the news that profusely sweating celebrities worried about being outed as perverts are responsible for rising sea levels. Read the news. @Reuters – BREAKING: American radio show host Garrison Keillor fired over allegations of inappropriate behavior – Minnesota Public Radio statement. Good grief. Come on, dudes, keep your nasty hands and tongues and faces and private bits TO YOUR SELF. How is that difficult to understand????? Sickening perverts. Given the conclusions of recent research, that predestination was no central dogma to, and did not affect the method of reformed theology, this study investigates the question of if and how the doctrne of predestination affected the ideas and practice of preaching. The relation of predestination and covenant, congregation, atonement, faith etc. are researched in the theology and sermons of John Calvin, Theodore Beza, John Diodati, and Theodore Tronchin, Francis Turretin, and Benedict Pictet. 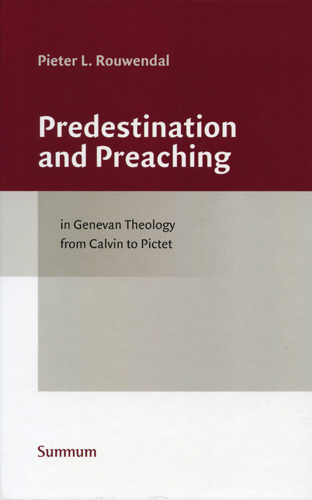 This study shows that in Genevan Reformed Theology from Calvin to Pictet, predestination and the external call were inseparably connected, but that the doctrine of predestination neither dominated the content nor restricted the address of the external call. Former Ku Klux Klan leader David Duke praised President Trump on Wednesday for sharing videos from a far-right British politician purporting to show violence committed by Muslims. ‘We’, for Duke, are racist vermin bound for the sinners eternal hell. If I were Trump I would be terribly upset right now and I’d find me a Pastor and ask him or her ‘What must I do to be saved’. If David Duke is for you, God in heaven isn’t. Why did the Museum of the Bible’s scholars destroy ancient Egyptian artifacts? By the tag team of Moss and Baden. Give it a read. Evidently the perviness is everywhere.